Does Michael B. Jordan Have to Keep Buying Sweaters Because His Arms Destroy Each One? First and foremost, Jordan has impeccable sweater taste, never prioritizing cute over comfy. Michael B. Jordan does not wear sweaters like you and I wear sweaters. He has biceps, pecs, and abs to keep warm! See how exactly he pulls at the sweater’s hem, taking care to keep it perfectly in place? That’s a full-time job, deserving of at least 27 Oscars! “There’s some room right here,” someone off camera says as Jordan looks around for a spot to perform his push-up. Here, yes; in that sweater, no. Perhaps Michael B. Jordan is just into a tighter sleeve. Fair enough. But maybe it’s that, by divine ordinance, Michael B. Jordan is simply too good for us and whatever sartorial options other regular humans have to offer. 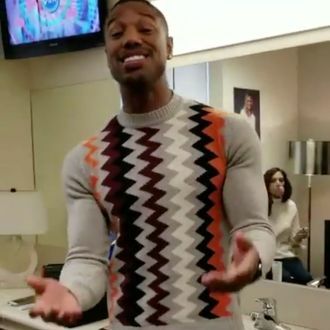 Have you ever seen Michael B. Jordan wear a sweater twice? Probably not! Because there’s no way for a sweater to ever recompose itself! The Michael B. Jordan–wearing–sweater beat is one we have decided to keep an eye on.